Veneers are a popular cosmetic treatment designed to mask imperfections and create a perfect smile without completely replacing the tooth. Unlike other cosmetic procedures, veneers create further protection for the natural tooth underneath, making them an ideal solution for someone hoping to simply mask milk surface imperfections. In fact, veneers are often referred to as ‘instant orthotics’ as they provide a substantial cosmetic effect with minimal tooth preparation. Visit #1 Veneer Preparation: Dr Aisha Ahmed and her team prepare veneers across two visits to the dentist. During the first, the teeth are carefully prepared by removing between 0.3 to 0.5 mm of enamel, or the equivalent of the thickness of a fingernail, to allow space for a veneer layer. Dr Aisha Ahmed will then take an impression of your teeth and sent it to a specialist dental laboratory to create the veneers. Visit #2 Veneer Bonding:In the second step of the procedures, the veneers are carefully bonded to the tooth. Following the cleaning of the veneers, it is bonded to the tooth with a special dental cements, which will hold it in place on the tooth surface. Once fitted perfectly to the tooth, the cement is hardened using a red curing laser light to make sure it stays in place and remains durable after the treatment is completed. Will I need anaesthetic to have veneers fitted? 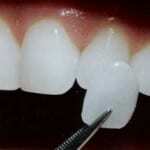 Before veneers can be placed on top of natural teeth they are required to be prepared. This involves the removal of around 0.3 to 0.5 mm of enamel from the surface of the teeth to make it easier for the veneer to bond to the tooth. Although this process is considered by many dentists to be fast, easy and pain-free, some patients do request to have a local anaesthetic during this process to make sure they do not suffer any discomfort at all. Will I require a temporary veneer? Veneers can be fitted within just two visits and the only changes made to the tooth between the first and second visit is the removal of a small amount of enamel. With porcelain veneers, temporary veneers will be required and are included as part of the treatment. You also have the option to have a Trial Smile which allows you trial your veneers before getting the permanent veneers made and fitted. An option worthwhile to go for. Are veneers better than crowns? Veneers and crowns are two cosmetic dental procedures that have been created with similar goals in mind, to create a flawless smile without removing natural teeth. In some ways, veneers are preferable to crowns. This is because they are less time consuming to create and fit, and also change the teeth less than a crown, making them an ideal choice for those wishing to keep their teeth as natural as possible. However, veneers are not right for everyone, and this is particularly true of those with significant damage to their back teeth or decay in multiple teeth, who are more likely to benefit from a specially designed crown to cover the damage. Crowns are also preferable in cases where many teeth need replacing as they can be linked together into a multiple-tooth restoration known as a bridge.